-Get a cheap(.97 cents)football mouthguard from Wal-Mart or any sporting goods store. 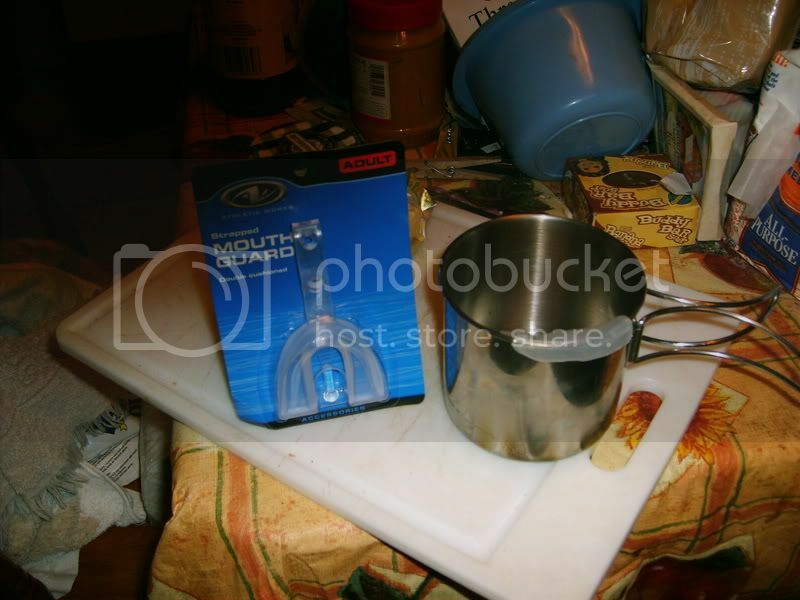 -Handfit the mouthguard to your pot. Carefully! -Let cool on the pot, cut off the mouthguard strap, and then brew some coffee to test. This is just a first try. The first thing I noticed about the lipguard is that it's a lot bigger than it needs to be. I believe you could cut it in half or use a 'youth size' mouthguard and probably get the weight down to .2 or .3 oz. It works even better that I thought it would. I half expected it to dribble down the side a bit when drinking but the mouthguard material molds so well to the pot that not a drop escapes. I was also worried that the plastic would re-soften when I clipped it over the rim of a hot cookpot. For my test I made sure to put the lipguard on the pot immediately after removing it from the stove. The coffee itself was way too hot to drink(I boiled the crap out of it) but I could hold the pot to my lips as long as I wanted to with nary a scorch. Bottom line is that you can leave the Nalgene at home, carry a platy or Gatorade bottle for hiking water, and save about 3 oz. if you only really carried the Nalgene for hot drinks in the first place. Hope it's useful for some of you and let me know how it turns out. Yep i did that some time ago cut in half works great. But if you leave it in the hot water to long its a goner. Almost cant find it its just like jelly. I found them in the sport stores but was not willing to shell out $10.00 and some on sale for $5.00. Thanks for directions for the less expensive ones. I feel better about going that route with the possibility , like oops said, melting away. Here may be a quick fix: I've put TWO (2) bright yellow rubber wrist bands that you can buy these days (to support a particular cause - think Lance Armstrong's "LIVESTRONG" wrist bands) around the outside top of my Henieken pot for drinking out of. Keeps the bottom lip from getting burned when drinking from pot. The only challenge you may have: if flames from stove reach top of the Heineken pot, the top one may loosen up and slide off, but that usually is a non-issue. If this does come off, it can easily be slid right back on. I have not tried it, but you could glue them both on?? I keep both of mine on all the time, even when cooking with no problems. Use a bright color band (yellow / orange / white) to see the top of the drinking pot in low light. Backpackerguy has the quick fix and also is dual purpose. I'm sure the bands can be used for other emergency needs. Good tip, thanks!! BackpackerGuy wrote: Here may be a quick fix: I've put TWO (2) bright yellow rubber wrist bands that you can buy these days (to support a particular cause - think Lance Armstrong's "LIVESTRONG" wrist bands) around the outside top of my Henieken pot for drinking out of. Keeps the bottom lip from getting burned when drinking from pot. A dab of JBWeld would hold that sucker in place, I bet.